The vast majority of biomechanical evidence favors double-row repair and/or transosseous-equivalent double-row repair with respect to footprint contact area, footprint compression, ultimate load to failure, and gap formation for full-thickness posterosuperior rotator cuff tears. Studies have documented a lower rate of imaging-diagnosed rotator cuff retears when traditional double-row repair is compared with traditional single-row repair types. Level-I clinical outcome studies have typically failed to document a difference between single-row and double-row repairs in terms of clinical outcome measures; however, these studies are often underpowered and therefore at high risk of having a type-II error. The authors recommend performing a transosseous-equivalent double-row repair whenever tissue mobility permits. Over the past two decades, arthroscopic rotator cuff repair has become one of the most popular orthopaedic surgical procedures because of its proven ability to diminish pain and improve function in patients with symptomatic rotator cuff tears. As a result of this increasing demand, arthroscopic techniques have evolved rapidly in an effort to improve structural integrity, biomechanical function, and, ultimately, clinical outcomes. 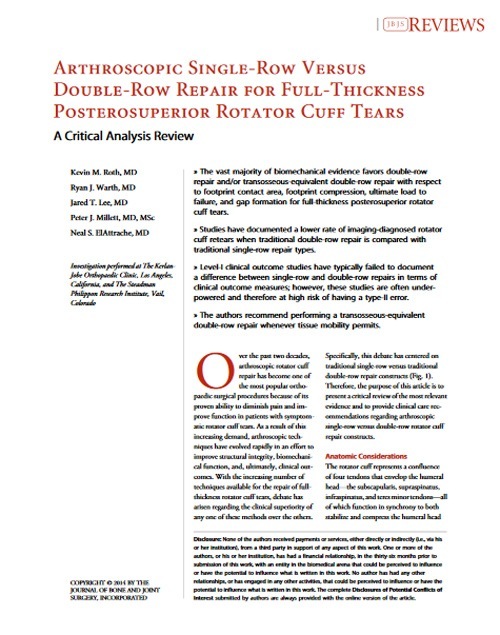 With the increasing number of techniques available for the repair of fullthickness rotator cuff tears, debate has arisen regarding the clinical superiority of any one of these methods over the others.